Power electrical appliances in your car with Tripp Lite's INT Series PVINT375 DC-to-AC power inverter. Converts 12 volt DC power from your automotive cigarette lighter jack to modified sine wave AC power compatible with 220-240 volt/50Hz equipment. 375 watt continuous/600 watt instantaneous peak surge power handling capability powers laptop computers, battery chargers, TV/VCRs, gaming systems and small power tools. Universal outlet accepts French, German and UK style connectors, plus a variety of international plug sets. Rugged, all-metal case design withstands abuse in a compact format weighing approximately 1 kg. Built-in low-battery alarm and auto-shutoff prevents deep battery discharge. Includes lighted power switch, user replaceable fuse, built-in cooling fan and 1 meter DC input cable. Tripp Lite’s PVINT375 375W PowerVerter® Ultra-Compact Car Inverter converts stored DC power from a user-supplied 12V battery to modified sine-wave AC current compatible with 230V equipment. Just plug it into your vehicle’s 12V cigarette lighter or accessory outlet to power components ranging from laptops, video game systems and DVD players to small power tools. With no fumes, fuel or excess noise, this portable DC-to-AC power inverter is an excellent alternative to generator power. The PVINT375 accommodates instantaneous peak surge demands by providing up to 160% more output power than its continuous rating of 375 watts. It can deliver 600 watts to support power-hungry equipment startups and motor cycling requirements. If it detects an overload, the PVINT375 automatically shuts down and sounds an alarm. A replaceable DC fuse and a built-in cooling fan help prevent damage to the unit and connected equipment. In addition to overloads, the PVINT375’s built-in alarm system also sounds when it detects low voltage. The unit then automatically shuts down to preserve your vehicle’s battery. The PVINT375 features a compact, lightweight aluminum housing that weighs only about 2 pounds (1 kg). 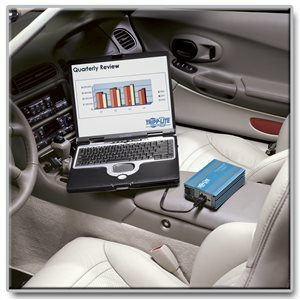 It withstands daily use and is easy to carry in your car, truck, RV, boat or anywhere else reliable AC power is needed. The AC outlet accepts 230V AC equipment you would normally plug into a wall outlet. A universal global outlet that accepts a variety of international plug sets is included. The PVINT375 comes with a one-year warranty. It’s manufactured in compliance with strict RoHS specifications, reflecting Tripp Lite’s commitment to environmental responsibility.